Ethical advertising: does it appeal to you? I recently stumbled on a press release from an English Adtech company IOTEC [which calls itself an ethical media buying platform] and I could not believe what I saw. It is rare that I set my sights on CP but this one was very original and unexpected, and the timing was perfect too. This IOTEC announcement advocated the use of ethical advertising by providing tips that I’ll quote below, making them simpler: ceasing psychological targeting, avoiding pop-us and intrusive ads, and checking the display announcements. In this piece, I have investigated the matter to find the truth about advertising and transparency. “Trust in advertising has never been so low” – true or false? The reason given by IOTEC is that “trust in advertising [has] never been so low”. I’m not a big fan of advertising even though I wouldn’t go as far as Doc Searls calling it “cancer of the Internet“. It is true that I am more of the opinion that word of mouth marketingis the future of marketing as much as it was its beginning. Besides, social media gave prominence to word of mouth marketing. Hence, my point. But the fact that I [or IOTEC] am convinced by a concept which I find apt, moral and respectful, does not mean that it is true.And even so, one could imagine that consumers – who are not always consistent – think something and do otherwise. Or they may hate advertising but are nevertheless influenced by it. Even more, consumers could put trust in the ads they like, and they shun the ads they dislike. Perhaps also marketers, who are self-obsessed, see the need to attribute a moral value to their advertising (“trust” is a pretty strong term). Is an ethical advertising approach demanded by consumers? For example, I can be completely aware of the manipulative – even deceptive – nature of an advertisement for a computer that roaringly proclaims (one with an apple on its cover for example) that it is more powerful than the others (with another logo and another OS), even though when we look at the numbers, this claim is all but true. And yet they might let themselves be convinced by advertising for other reasons (aesthetics, status offered by the product at a premium price, quality of construction, possibility of resale, …). After all, it may well be that the consumer, who is quite educated, knows perfectly how to decode the manipulative aspect of an advertisement and that he lends himself to the exercise nevertheless, by game or by pleasure. Finally, if it turns out that advertising is a victim of disenchantment, and that the appetite for ethical advertising could be justified and that all this is perfectly logical, are these facts sufficient for advertisers to act likewise and for consumers to ask for these changes? Last but not least, can the recent cases of data theft and the more or less questionable behavior of certain major players of the Internet, depending on the interpretation, be a trigger for a change? So, let’s take some time to think about these points, ask some basic questions and try to find answers based on facts, figures and studies. First, is there a loss of confidence in advertisingand what does it mean? Is it new? And, is this true for all countries? Second, are advertisers aware of this problem– if it exists – and what are they planning to do about it? Finally, I will come back to the basic principles of ethical advertising, once again using the press release of IOTEC. Point 1: Is the mistrust of advertising real or not? According to Digiday, Brits (about 70%)- with differences in views between Londoners and the rest of the UK- are more skeptical towards online ads than Americans (58%), French (54%) and other Europeans. However, Nielson’s report has some different findings: In France, consumers are more defiant. “Compared to the results of 2013, consumer confidence has fallen on the recommendations of loved ones and the opinions of other online consumers. Topics such as fraudulent practices (a public broadcast recently made the buzz by creating a fictional restaurant and false opinions) are frequently discussed on media, which undoubtedly reinforce the well-known skepticism of the French. Conversely, the other formats are rather in progress, whether on traditional media (television, radio, press) or digital media (banners, social networks)”, says Anne-Valérie Nierlich, media expert at Nielsen. The discrepancy is perhaps due to the errors in representativeness of the sample. But, there are variations. But, that’s not what we hear everywhere (the banners do not work, the ad on TV is over …)? Good! It was so in 2015, but after the famous Forrester report on “the end of advertising as we know it“, are there other studies that could shed light on topics not covered in this report? 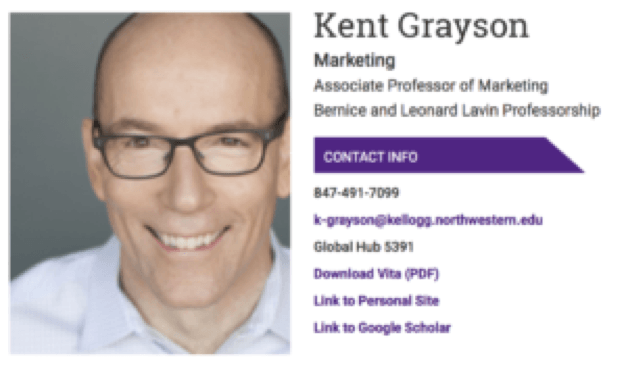 was led by two professors, Kent Grayson (right) from Northwestern University and Matthew Isaac from Seattle University, who showed that consumers would have more confidence in advertising than one might think. This study was relayed by Social Media Week. In essence, the study and analysis of social media week show that consumers (or interviewees rather, I’ll come back to this in a moment) are less defiant vis-à-vis advertising – or rather some forms of advertising – which impugns the common perception. But they are, above all, more educated than in the past and they can’t be fooled. Ethical advertising scores one point with this. In other words, what matters most is with that trust in advertising has been eroded, the truth is that certain tactics perceived as being just and direct by consumers make transparent advertising (and thus ethical advertising) not only relevant but also more effective. It seems that the meaning is very broad, and the interpretations are many. In conclusion, the answer to my question is “neither yes nor no”. It would be wrong to infer from these studies and figures that advertising as a whole is rejected by the public. On the contrary, it should be understood that specifically the manipulative tactics of marketing, or those that are perceived as such by consumers, instigate their mistrust. The good old tactics of the opinion leader do not belong to this category. Hence, ethical advertising has every chance: it is an arsenal for the future because it corresponds to a real demand – a priori – of the market. These are interesting insights, but need to be modified, however, according to the survey methodology used by the two academicians. The survey is indeed centered around America and includes only 400 respondents (a margin of error of 5% acceptable for the US, provided of course that the sample is representative). Here is our answer to the first question. What about the second one? Have advertisers changed their habits? ← Insourcing or Outsourcing Digital Transformation Endeavours?